Seaside Championship Course located alongside 90 mile beach at Lakes Entrance.Links style course with poanna greens and ocean views on several holes. Highly rated course and public most welcome. Phone Pro Shop 03 5155 2832 for bookings. 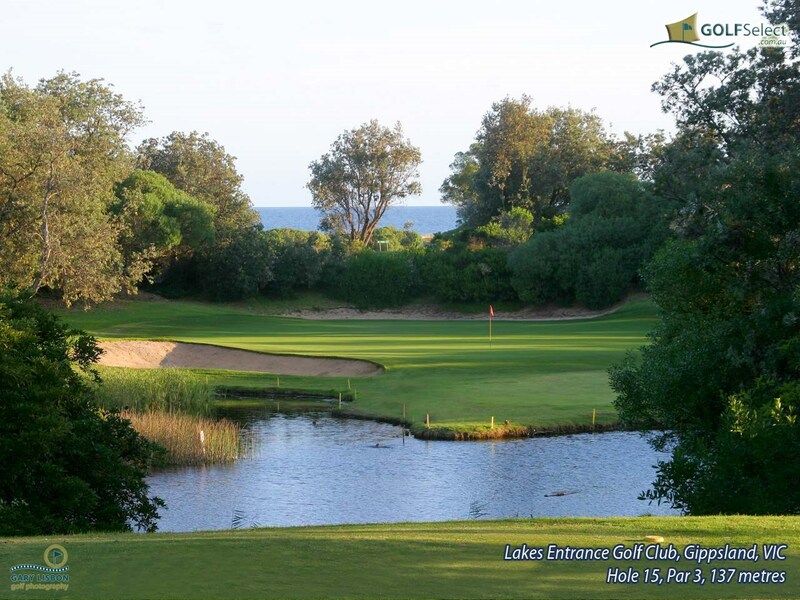 The layout and presentation of Lakes Entrance Golf Course are nationally recognised and they are rated 77th of all golf courses in Australia; resort, private and public included. The course has over 150 different residents and regular visitors; eagles, kites and other raptors, honeyeaters and parrots aplenty (including the rare swift parrot), sea and water birds in droves and much, much more. Water again threatens the tee shot but this time the threat is more overt. Risk and reward again, bite off as much as you dare. The large fall on the green means the task is not completed until you are safely in the hole. The large and quietly undulating green, the bunkering and the wind combine to make an innocent looking par three something of a "sleeper". The third also introduces the unwary to the interesting sand in the bunkers. This hole marks the start of the worlds largest bunker; the Ninety Mile Beach on the right. The view from the Mens tee matches the grandeur of this testing par four. Long and well trapped on the left for the tee shot, and the right for the approach shot. This hole provides a challenge, the right is nothing but trouble and the huge green has both slope and borrow to conclude a fine golf hole. A seemingly simple par five, this hole requires accuracy and course management. Fairway pots short and a menacing greenside bunker right demand careful attention. Again the risk for the long hitters is to make the green in two, possible but accept the punishment if you fail. This is the longest of the par threes and is guarded by bunkers and trees. Its big green is sculptured has many subtle, and not so subtle, breaks. Probably our signature hole, the demanding par four seventh begins with a captivating view. A small lake on the left captures more balls than its size suggests. The funnel short of the green gives the hole its name, "The Khyber Pass"; narrow and treacherous. The huge green slopes and dips so no putt is a gimme. Short, innocent but dangerous sums up the eighth hole. A green, well guarded by mounds and bunkers, is the golfers reward for a straight drive and short iron shots which have avoided water short left and long right. The smaller green is not without its difficulties either. The ninth hole continues with the theme of water and large and sloping greens. It would be an errant drive that finds water right but the second shot can easily catch water. Again there can be risk and reward. Long hitters may try for the green in two but this is not without danger. The green is one of the most difficult on the course, large, sloping and hard to hold, despite its size. Good placement and accuracy are essential on the par four tenth hole. The big dogleg left opens onto a green protected by a crater on the right and a shallow bunker on the left. One of golfs most strategic trees also protects the green on the left. The eleventh hole features an island tee which is the most exposed on the course. Like all the par threes, the job is not done by hitting the green. A tiered green and gentle borrows add interest to a picturesque hole. This long par four requires two big shots but the wide and generous fairway invites this approach. Another big green is divided in two by a low step which allows for a number of interesting pin placements. The thirteenth is a short par five with a well-guarded green. The hazards of Shepherds Bush, narrow landing area for the second shot and trees in greater number protect this hole. Undulations short of the green can deceive and demand more thoughtful club selection. A magnificent and oft under rated par five, the fourteenth is visually a treat for all golfers. It requires length and accuracy and rarely are your feet at the same level as your ball. Out of bounds on the left edges its way closer and closer as you approach the green. Bunkers on the right and a sheer slope on the left protect our largest green. The par three fifteenth is another hole that is visually impressive with great ocean views from the Mens tee. The wind can make club selection a most demanding task. Well bunkered and protected by water once again this hole is not conquered simply by hitting the green. The sixteenth is a tight driving hole for the Men but a well-placed strike sets up this shorter par four with the flattest of our greens. However there is the ever present water on the left from the Ladies tee to a lake finishing close to the green. The fairway is rather exposed and wind again exerts its influence. The par four seventeenth is another tight drive for both Men and Ladies. Our smallest green is hard to read and well protected by three bunkers. The fairway is narrow and the rough on the right has sunk many a round. Water again is the first impression but at least on the par four eighteenth it is for the last time. A dogleg to the left opens up a generous and flat green with only subtle borrow. Bunkers left and right protect the green.